Our aim is to build trust and relationships with marginalised communities, to connect people to the communities they are impacting, to learn about their lives, and with that, we seek to work together in understanding the problems and challenges that they face. But before we can solve problems, we must first understand that, all of us, including the community, play a role in a network of relationships that builds the problem of poverty, and has the power to affect change. Only by working together and learning from each other can we begin to understand how things came to be, and how to do things differently. The communities we have been working with reside in rural areas near town centres and adjacent to tropical forest reserves. Traditionally, land and materials have been relatively accessible through customary territories before it was formally gazetted as Forest Reserve with controlled industrial logging and restricted public access. In many communities, men & women almost equally went out to look for food and took care of the home, hence collaborative house-building and maintenance was a routine and skill cultivated since childhood, learnt through experiencing together with their elders. This culture of working collaboratively is known locally in the national language as “gotong-royong”. 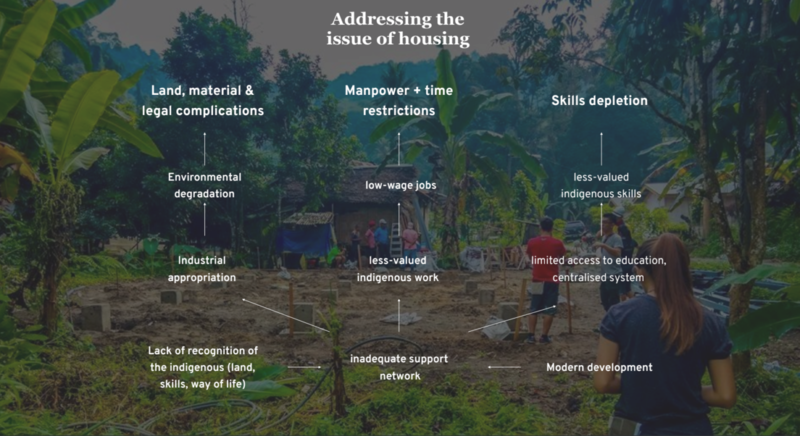 Lack of recognition of indigenous forms of land ownership & resource management builds an ecosystem in which their lands and resources become vulnerable to appropriation by various parties, particularly for industrial purposes. As environmental degradation worsens, many in the communities feel the need to adopt modern materials, jobs and education. Being relatively remote from the market and regulatory instruments, they are vulnerable to unfair trading practices. Hence, many take up jobs outside, though lack of recognition of their indigenous knowledge and inadequate formal education only allow them low wage, insecure jobs with no formal contracts, unpaid leave, minimum wage, maximum working hours, medical and pensions benefits. Being paid by day, taking time off work for a day to build their own houses could mean not getting pay for the family to eat for the day, or loss of their jobs. This makes them unable to afford buying modern materials, hiring skilled builders and getting modern education to develop their skills. Preference for the industry to employ men and the gender pay gap also encourage men to leave home for paid work while the women stays in the community for unpaid caring work. With the added tendency of organisations to name men as the heads of the families, and the inherent gender segregation in modern housing layouts, the position of women become increasingly vulnerable. Prolonged absence of men from the community due to work also compromised local support network, cultural practices and their influence on their children, as the culture of “gotong-royong”, traditional craft, and customary rituals becomes less practiced. Their children no longer have as much opportunity to learn and develop these cultural knowledge and practices, and they also have limited access to modern education. Though pre-schools and primary schools have been physically more accessible to these communities since the year 2000, the mainstreaming of the school content and pedagogy have been incompatible with many minority cultures. Dropout rates have been high, with many not pursuing secondary education. As part of a strategic process of community capacity building to foster local support network as well as develop alternative channels for skills development and employment opportunities, EPIC practices “Pay It Forward” programme, in which home-owners participate in the construction of their own home as well as at least 2 others homes together with the participants, and their neighbours. By developing design and semi-prefabricated construction technology that enable the on-site construction of a home to be completed in 4-5 days of extended weekend, it reduces the need for the community to take extended time off work. Opportunities in various scopes of work beyond physically building are made available, especially for women, who are often more available for community organising and providing hospitality services such as accommodation and food. Adopting indigenous ways of learning by experiencing, these opportunity become a platform for the community and visiting volunteers to share and develop new skills. Some of the locals have been given opportunities to be hired contractually for builds, from concrete casting to leading and training other home-owners and volunteer teams in their and other communities. Through the networks made, we are able to support their own economic and cultural initiatives such as indigenous building techniques, craft and skills workshops by incorporating them into projects. We believe in the importance of cross-sectorial collaboration, from civic society to government and private sectors, as a key factor that contributes towards change. The goal behind each build is for a support network to be developed, providing access to valuable opportunities and resources. Volunteers work closely with villagers as facilitators, aiming to build self-confidence, dignity and enable the power of choice. 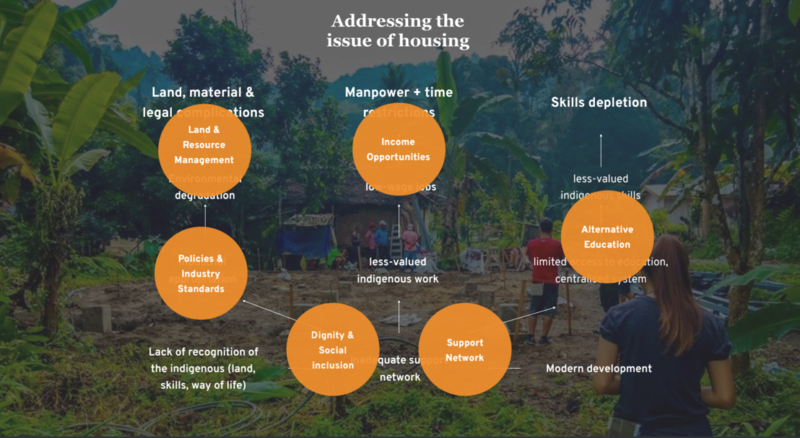 To foster social inclusion, raise awareness of the dignity of the Orang Asli culture, develop a community support network and knowledge exchange, participation of trained visiting volunteers and socio-technical experts in various stages of community engagement, asset mapping, planning and design to the actual building of homes with the communities are strategically curated. To achieve this, we continuously develop various training modules to cater for the various stages of the project. Beginning from development of personal capacity, we prepare participants for personal engagement with communities, which leads to relationship building, to trust and finally cooperation – the first stage of our goal in enabling cooperative, resilient and sustainable communities. 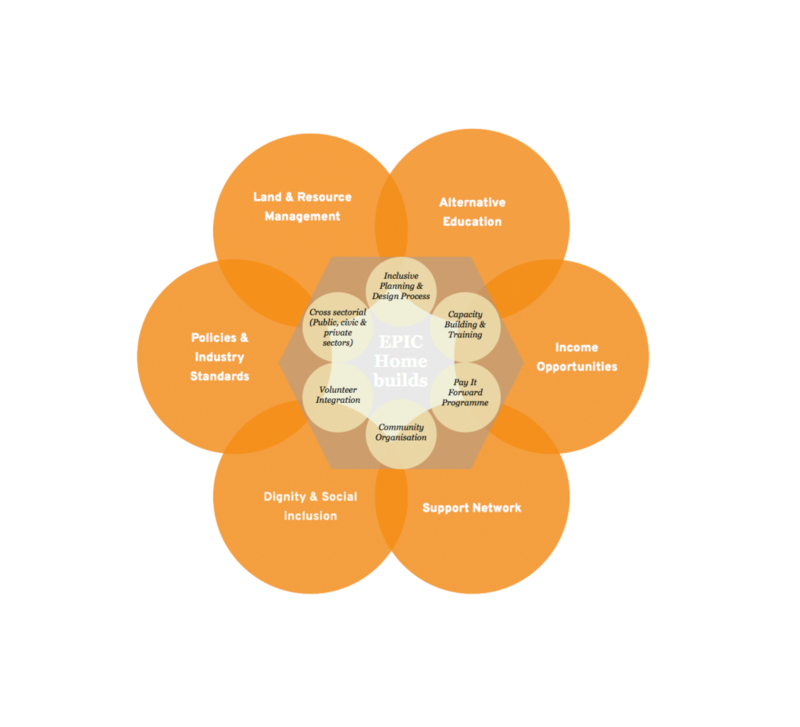 Recognising the community dignity and to harness their ability to organise and mobilise their assets, EPIC strives to include not just the home-owner, but the wider community in the different stages of Inception, Asset Mapping, brief Development, Implementation and Occupancy. Our entry to the community are only done by their consent, projects are only commenced upon personal consultations with them, and are organised with collaboration with community representatives. Collection of family information and physical assessment of individual houses are led by community members themselves who are familiar with the families and their dynamics, while visiting socio-technical experts act as facilitators and provide check and balance mechanism. The community are also facilitated to come up with a consensus regarding criterias of prioritisation, and working processes. To cultivate a collaborative ecosystem that can influence change in policies, industry practices and standards, we strategically partner with community-based groups, civil society groups and industry players like government agencies, private companies, and educational institutions. We strive to provide a conducive platform for these parties to work together with the communities, towards recognising the community assets, values, and aspirations. Some of the communities we have been working with are not legally gazetted as a settlement, and by geographically mapping the community and building semi-permanent structures, the community ownership and management of their territories and resources have been made more visible in the eyes of the public and the government, to the extent that it has encouraged further support from them.